Designed for all skin types, Cetaphil Gentle Skin Cleanser cleanses without irritation to leave your skin soft and smooth. This mild, soap-free formula moisturizes skin as it removes dirt, makeup, and impurities. It also maintains skin's natural moisture barrier without stripping its natural protective oils or emollients. Mild, non-irritating formula. Softens as it cleans. Every age. Every stage. Every day. This gentle, soap-free cleanser was originally formulated for dermatologists, specifically for everyday cleansing of even the most sensitive skin. Soothing, non-irritating, ideal for face and body. Helps skin retain needed moisture. Rinses easily and leaves skin feeling soft and smooth. Mild enough to cleanse a baby's delicate skin. Non-comedogenic.. Fragrance free. Dermatologist recommended. Made in Canada. Since 1947, Cetaphil has been committed to finding innovative solutions to treat skincare needs. 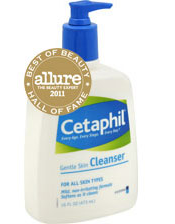 The recipient of multiple industry product awards and seals of approval, Cetaphil currently has five global research and development centers staffed with doctors and other healthcare professionals to develop skincare products that cleanse, moisturize, and protect skin without irritation. Cetaphil products are not tested on animals.